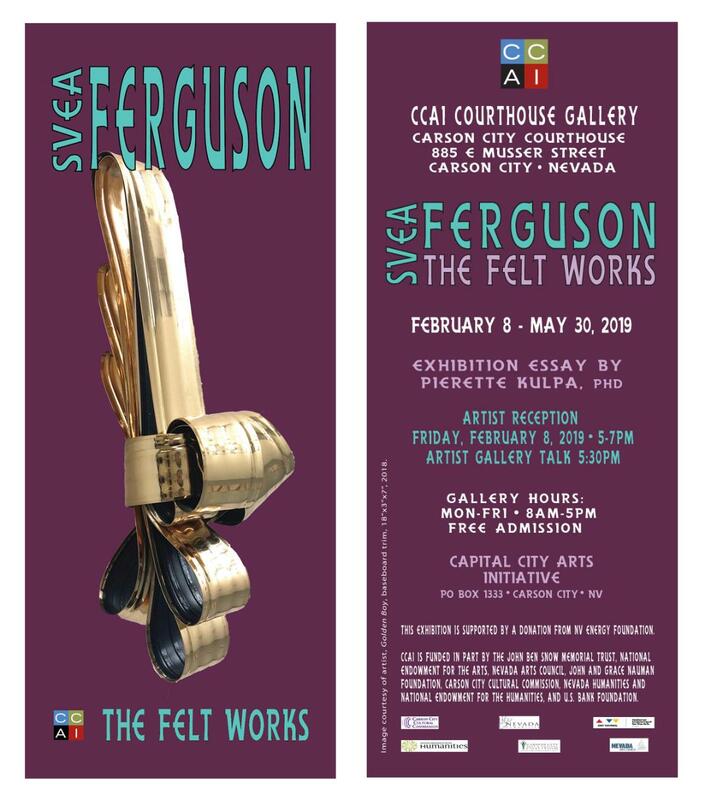 The Capital City Arts Initiative [CCAI] presents its exhibition, The Felt Works, by artist Svea Ferguson at the CCAI Courthouse Gallery. CCAI will host an opening reception on Friday, February 8, 5-7pm; the artist will give a brief talk about her work at 5:30pm. The exhibition will be in the gallery from February 8 – May 03, 2019. The Courthouse is located at 885 E Musser Street, Carson City. The reception and the exhibition are free and the public is cordially invited. 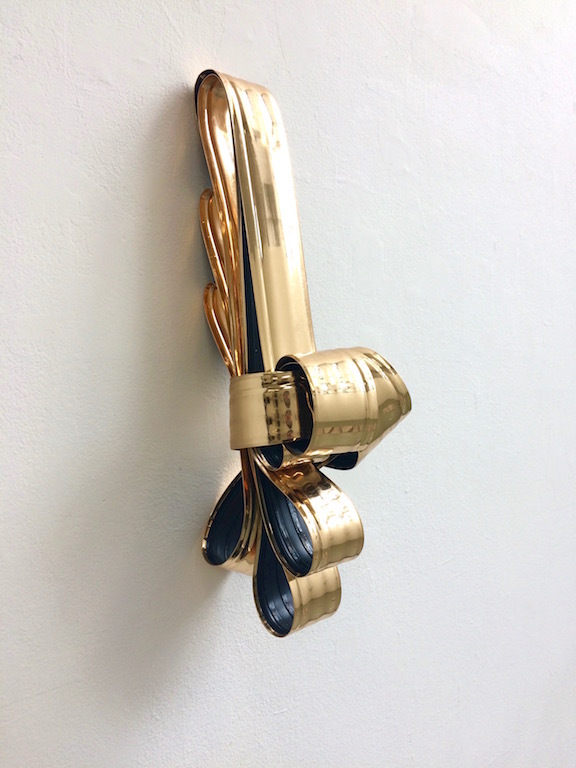 The gallery is open Monday – Friday, 8am – 5pm. Artist Svea Ferguson, based in Calgary, Alberta, Canada, created her wall sculptures from common materials found primarily in domestic spaces. She uses vinyl and linoleum flooring materials designed to mimic the appearance of high-end options such as marble, granite, and hardwood at significantly lower costs. These flexible, faux veneers present physical qualities, which allow them to be easily manipulated by the hand, without the need for specialty tools or facilities. Ferguson, a Calgary-based sculptor and installation artist, earned her BFA from the Alberta College of Art + Design. Her work was included in the 2017 Alberta Biennial of Contemporary Art at the Art Gallery of Alberta and the Walter Phillips Gallery. She was named the provincial recipient for the 2015 BMO 1st Art! Prize. Her work is included in numerous private collections and the permanent collections of the Banff Centre and TD Canada Trust. 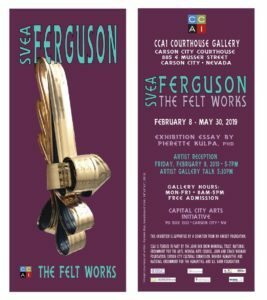 During her Carson City visit, Ferguson will give talks about her art practice to Douglas High and Sierra Nevada College art students. Dr. Pierette Kulpa wrote the exhibition essay for Ferguson’s The Felt Works. Kulpa has published on the reception and appropriation of the Renaissance under fascism and investigates the history of Michelangelo’s legacy in the centuries after his death. She received her doctorate in art history from the Pennsylvania State University and her master’s degree from the Courtauld Institute of Art in London. She is currently teaching art history at Kutztown University in Pennsylvania. This exhibition is supported by lead donations from the NV Energy Foundation, the Alberta Foundation for the Arts, and the Banff Centre for Arts and Creativity. The artist and CCAI thank them for their generous support of this project. The Capital City Arts Initiative [CCAI] is funded in part the John Ben Snow Memorial Trust, National Endowment for the Arts, Nevada Arts Council, John and Grace Nauman Foundation, Carson City Cultural Commission, Nevada Humanities and the National Endowment for the Humanities, and U.S. Bank Foundation.